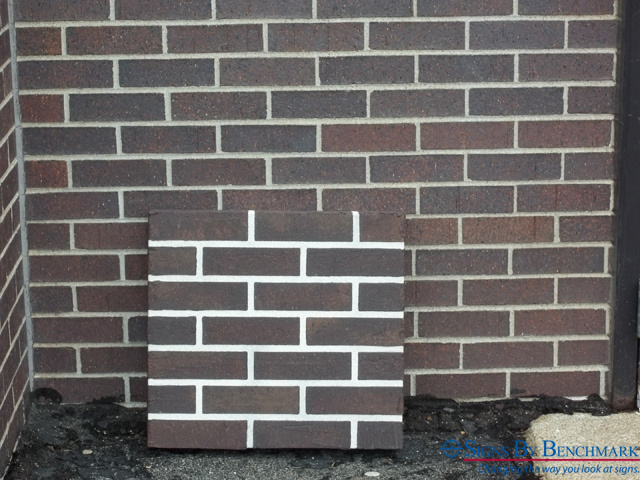 In collaboration with Best Buy Signs of Omaha, Nebraska, Signs By Benchmark recently created a custom monument sign to match existing brick elements of the nearby building it would advertise. 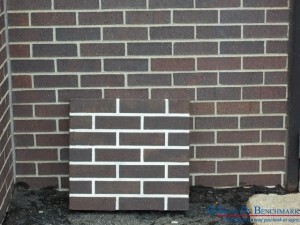 Working from precise measurements, matching paint chips and high quality digital photos, the Signs By Benchmark team once again proved their talent for creating high quality faux finishes. 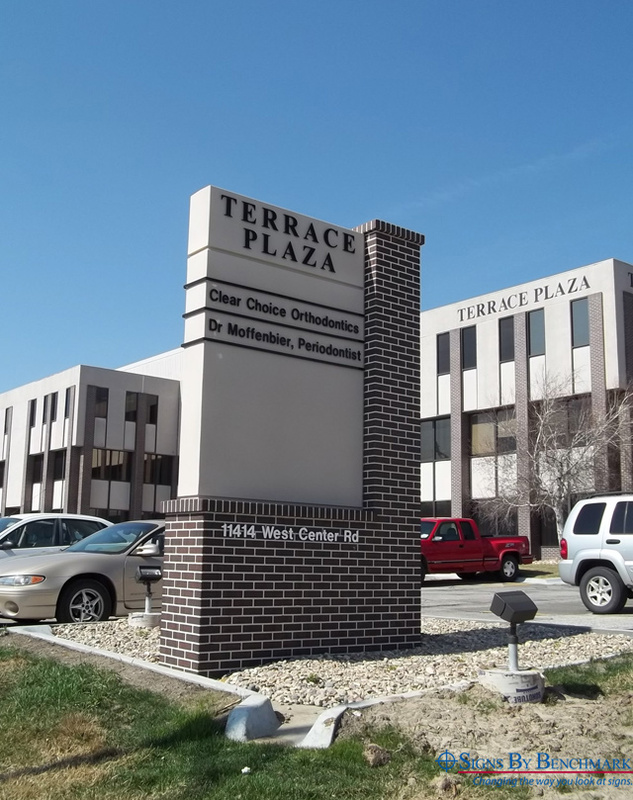 The monument was designed by Best Buy Signs in accordance with Omaha city ordinances that require the sign to match existing surroundings. 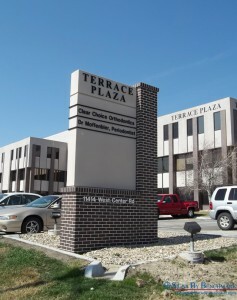 Because the building is a multi-tenant property, space had to be created in the sign for advertising multiple tenants. All sign components were CNC cut or handcrafted to meet design specifications. 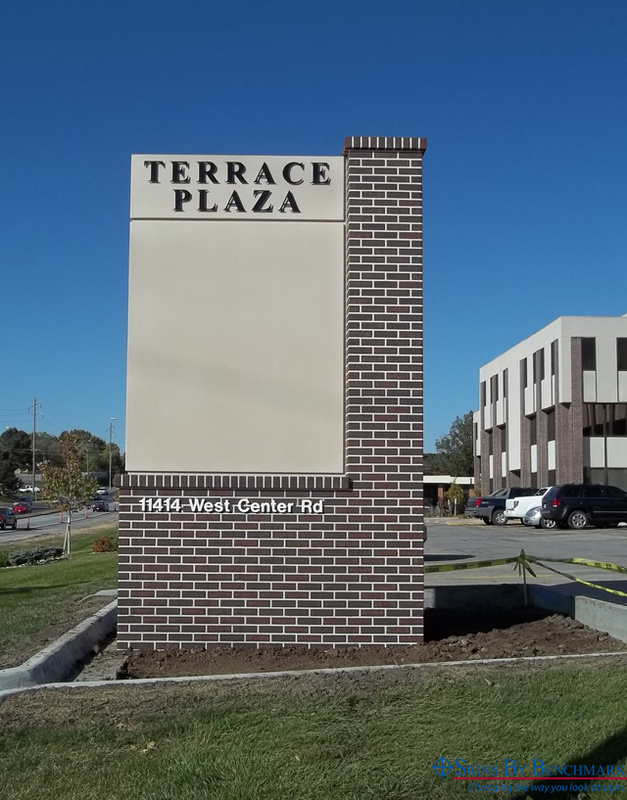 Once assembled, the entire sign was sealed into a solid unit with Signs By Benchmark’s signature hard coat that ensures long lasting durability. Measuring 14′ 1 1/8″ high x 8′ 2 1/2″ wide x 27″ deep, the sign has no problem standing above the crowd. 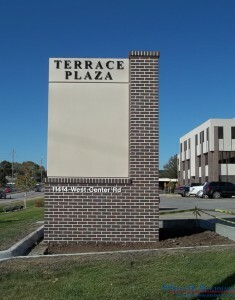 Its classic faux brick base and column provide a striking contrast to the sign body’s one-color acrylic stucco finish. Installation of the lightweight cellular plastic sign was a breeze. Using pick points installed by Signs By Benchmark, the Best Buy Signs installation team quickly lowered the monument over poles previously installed according to placement specifications provided by Signs By Benchmark. The Best Buy team installed Gemini letters after the sign was installed and continue to install lettering on behalf of tenants. As tenants change, the lettering is simply pulled out and the small mounting hole filled with a dab of caulk then touched up with the stucco touch-up kit sent with every Signs By Benchmark sign. Give the Signs By Benchmark team a call at 800-658-3444 to discuss your upcoming projects. They will work closely with you to realize all design details that ensures ultimate satisfaction for your customers.